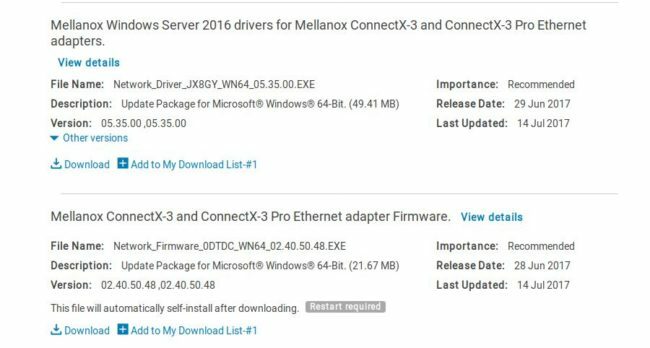 New Mellanox drivers on the Dell website! New Mellanox firmware available on the Dell website for the ConnectX-3 (Pro)! Normally I wouldn’t get excited about this, but for S2D implementations and Dell PowerEdge R730xd this is very welcome news. The Mellanox cards from Dell should be using the Dell firmware and drivers (this was said by support staff from Dell and Mellanox) and until now the drivers were about a year old, before even S2D was RTM’ed in WS16. Be sure to select the WS16 OS for the correct drivers and read the releasefile before applying! Quizzz: RAID1 setup for the OS in a S2D config..